The ‘V’ shaped recovery rally on the daily bar chart pattern of S&P 500 continues to face resistance from bears. Bulls have managed to overcome the resistance zone between 2800-2825 after five weeks of struggle. The next resistance zone between 2850-2875 is looming above. A convincing move above 2875 will clear the path for the index to touch a new high. Bears may continue to yield ground grudgingly. Daily technical indicators are in bullish zones after correcting overbought conditions, but are not showing much upward momentum. MACD is below its sliding signal line. RSI has bounced up from neutral zone. Slow stochastic is moving sideways after falling from its overbought zone. 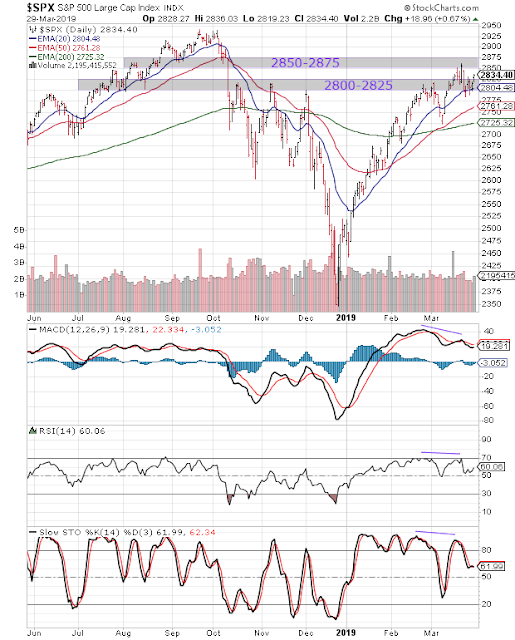 Negative divergences on all three indicators – which failed to touch new highs with the index – triggered a correction below the rising 20 day EMA. On longer term weekly chart (not shown), the index closed above its three weekly EMAs in a long-term bull market for the ninth week in a row. Weekly MACD is rising above its signal line bullish zone. RSI is moving sideways above its 50% level. Slow stochastic remains well inside its overbought zone. The daily bar chart pattern of FTSE 100 made a valiant effort to cross above its 200 day EMA and stay in bull territory, but faced profit booking and dropped to seek support from its rising 50 day EMA. The index has since bounced up to close above its three EMAs in bull territory. 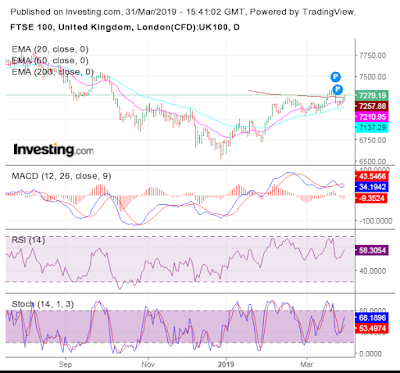 After touching a low of 6536.53 on Dec 27 ’18, FTSE has formed a bullish pattern of ‘higher tops, higher bottoms’ and gained more than 830 points (12.8%) by touching a high of 7370.61 on Mar 21 ’19. Daily technical indicators are looking bullish. MACD is trying to cross above its signal line after falling below it in bullish zone. RSI is rising above its 50% level after correcting from the edge of its overbought zone. Stochastic is also rising above its 50% level after falling from its overbought zone. The BrExit process appears to be heading towards a messy end. The British PM got an extension of time at the EU summit on Mar 21, and is pondering a fourth bid to get a deal passed by Parliament. On longer term weekly chart (not shown), the index closed above its three weekly EMAs in long-term bull territory for the second straight week. Weekly technical indicators are looking bullish. MACD is rising above its signal line and has reached neutral zone. RSI is rising above its 50% level. Stochastic is inside its overbought zone.